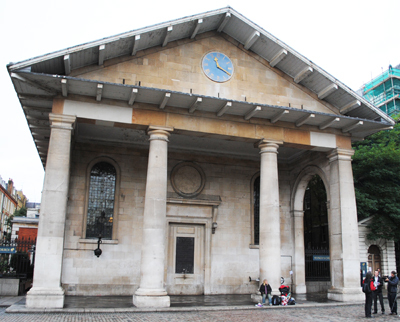 Now a favored place for people-watching among Londoners and visitors alike, Covent Garden takes its name from the ‘Convent Garden’ which occupied the site in medieval times. The ‘convent garden’, said to be a 40 acre kitchen garden, belonged to the Abbey or ‘Convent’ of St Peter in Westminster (Westminster Abbey was once the church of this religious foundation) which owned the site from the 13th century until 1548 when the land passed into control of King Henry VIII during the Great Dissolution. He granted much of the land to John Russell, the 1st earl of Bedford, and it was the 4th earl, Francis Russell, who commissioned Inigo Jones to design a great public square. The new square featured grand houses along the northern and eastern sides and a church – St Paul’s (pictured right) – on the west while to the south, between the square and the Strand, stood the mansion of the Bedford family. A fruit and vegetable market was licensed in 1670 but its growth – and the development of other squares offering a much greater level of privacy – led the wealthy who had originally occupied the houses to move elsewhere. The market, meanwhile, continued to grow and in the 1830s, the main market building which still stands there today was constructed. Further buildings followed in the 1800s and the market continued to occupy the site until as recently as 1973 when it was finally moved out to Nine Elms and the area began a transformation into the shopping precinct it now is.